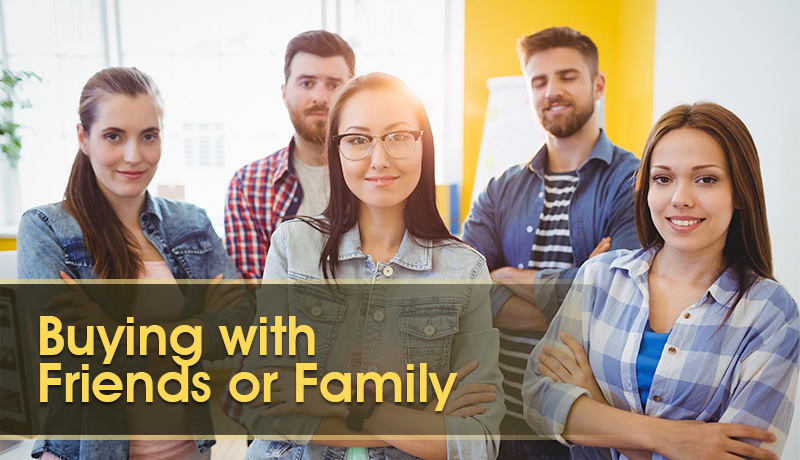 Should you Buy a Property with Family or Friends? On face value, the notion of pooling your financial resources with family or friends in order to buy a property makes perfect sense. It immediately increases your buying power, and for many first home buyers, it’s potentially one of the only ways they can afford to get into the market. But is it a good idea to buy a house with a friend or family, and what happens when things don’t work out? Here are some of the things you need to consider first. The attraction of buying with another person is obvious: it reduces how much you’ll personally need to save in order to purchase a home, and increases how much you have to play with as you enter the market. It’s a very viable option for many buyers who otherwise wouldn’t be able to afford it. There are benefits – you combine your borrowing power, so you can buy a lot more. This allows you to get into the market sooner (than if you had to save the additional money), and you’re going to get good capital growth, depending on the areas you’re looking at. When people buy a property as an investment, many do so with the intention of using the equity in that property to purchase another one in the future. But beware: if you’ve bought a property with someone else, lenders will calculate your debt based on the full value of the house. It’s a scenario that often catches people out. That’s one of the pitfalls of buying with someone else. It may be a problem if you’re looking at buying another property in the future. A lot of people aren’t aware of that. It’s critical that both you and your family member or friend are clear from the start about your goals for the property you’re about to purchase, and that those goals align. There’s no point in buying a property together, only for one party to want to sell up 18 months later, when you’d really hoped to hang onto it for 10 years or more. It’s just about making sure both parties have the same vested interest. It’s hard to think 10 years in advance, or even five years, but if you’ve both got a clear plan from the outset, it makes it easier to talk about when someone gets married or wants to leave. For one first home buyer, teaming up with their parents to buy their first home seemed like a brilliant idea, allowing them to enter the market years ahead of when they otherwise would have been able to. It was good in that it got them in the market at a stage in life when they couldn’t afford to do it alone. Everything was split 50-50: expenses, upgrades, landscaping, repairs, and so on. But things took a turn when it was decided that their sibling and their spouse and kids would also move into the house as renters. The first home buyer quickly found Themselves on the outer, and was then asked to vacate the house. Things weren’t working out and they were the one that got asked to leave, but was still expected to continue paying their share of the mortgage. Having a legally-binding co-ownership agreement drawn up by a conveyancer or solicitor is critical in case things don’t work out. If you have an agreement in place, then you can go back to the document and it’s on paper. Otherwise it can get dirty.